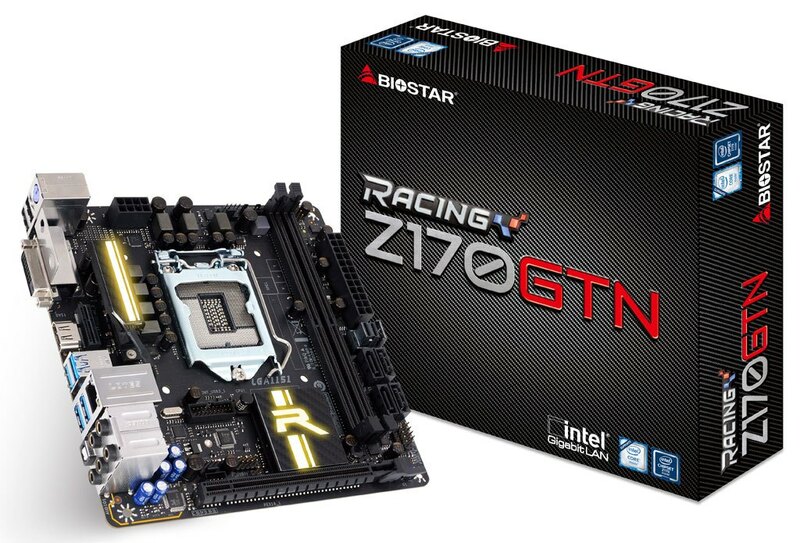 Taipeh, 12 September 2016 – BIOSTAR is pleased to announce its latest and greatest motherboard to join the prestigious RACING series motherboard family with the unveiling of the BIOSTAR Z170GTN mini-ITX motherboard. Everything that makes the RACING series motherboards from BIOSTAR now comes in a tiny form factor giving you all the power you need without compromising size and space. Gamers who want unrestricted performance but want a compact machine for their entertainment and gaming needs, the BIOSTAR RACING Z170GTN delivers everything you need. The BIOSTAR RACING Z170GTN allows full control of your system with support for unlocked 6th-generation Intel Core processors allowing you to fully maximize the capability of your system and increase performance. Support for memory speeds up to DDR4-3200 allows high-speed memory to compliment the overclocked system for improved responsiveness. The Intel Z170 chipset allows a full array of connectivity including rich USB3.0 connection and high-speed storage via built-in U.2 connector with up to 32Gbps bandwidth for next-generation storage allowing users to utilize the fastest storage platforms of today for super-fast access to data so games load faster so you can get to the action quicker. BIOSTAR RACING Z170GTN supports full-speed x16 PCIe 3.0 x16 graphics cards for maximum support for the latest graphics card from both AMD or NVIDIA allowing gamers to enjoy unhindered performance with their latest graphics card. BIOSTAR RACING signature stylish feature that allows gamers to be able to show-off their personal style is back with the RACING Z170GTN with BIOSTAR’s exclusive VIVID LED DJ and 5050 LED FUN joining the B150GTN as the world’s first mini-ITX motherboard with full RGB LED control for both onboard lighting and external lights. Both of these features allows customizable lighting for gamers who want a color-themed rig making your system the flash with brilliance. To compliment the colorful offering of the VIVID LED DJ function, BIOSTAR is giving everyone purchases a BIOSTAR RACING Z170GTN an exclusive free gift: get a free BIOSTAR VIVID LED FAN to stylize your chassis absolutely free with ALL BIOSTAR RACING SERIES motherboards including the BIOSTAR RACING Z170GTN. The VIVID LED Fan features full customizable color and lighting effects to compliment your RACING series motherboard. Install your own custom 5050 LED strip and customize your system, fully supported by the BIOSTAR RACING series motherboards and controlled by the VIVID LED DJ software. BIOSTAR equips the RACING Z170GTN with its high-quality BIOSTAR HI-FI audio solution for full aural immersion in your entertainment experience. High-powered and high-clarity brings excellent sound quality to your system and supports high-impedance headphones. Featuring BIOSTAR’s unique Hi-Fi Ground isolation technology, analog signals are isolated from the rest of the board for the purest audio digital reproduction. With upgraders in mind, BIOSTAR has placed a legacy PS/2 port in the RACING Z170GTN to allow players who prefer legacy peripherals to still use their devices on this motherboard. Video display output via DVI and HDMI are present with four (4) USB3.0 ports for high-speed connection to modern devices. A vertical M.2 slot allows a Wi-Fi card to be installed for added flexibility of wireless network connection or added high-speed solid-state storage.